Language: Spanish, with summaries in English and French. 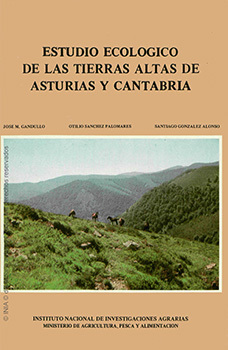 This study begins with a general description of the area concerned (Asturias and Cantabria. Spain) from a geographic, geologic, edaphic and climatic standpoint. Three large groups of existing vegetation formations have been considered: deciduous woodland, grassland and scrub. A sampling, in a total of 203 checking plots, has been carried out. These plots have been selected taking into account the existence of different conditions within these formations. In every formation, a division of the checking plots in groups of homogeneous biotopes has been made on the basis of their floristic composition. These groups have been analyses indepenthly. The study has been twofold: first, in connection with the features of the actual phytocenosis and secondly, by considering the nature and meaning of the most important ecological parameters. As result, the optimal and marginal habitat of each group has been defined. Finally, ecological criteria have been established for a possible change of the current area with scrub or grassland into woodland. Moreover, the possibility of transformation of areas with different types of scrub into grassland in measured. For this purpose, a detailed analysis is of the ecological parameters considered as permanent, has been made. These parameters have been compared with others which may change because of different processes. Physical Description : 210p. ; 17x24,il.;map. Other data of interest: - INIA. Servicio de Publicaciones. Ctra Coruña km 7,5. 28040 MADRID. Contact: distri@inia.es. Tel: 91-3471493. This book was added to our online catalog on Tuesday 06 March, 2012.